So this is our first collaboration. I'm pretty nervous, but I shouldn't be because it's something I love with someone I love. Dunes and I first met Kerri when we were styling and photographing her Connecticut home for a magazine. Her positive energy, her spirit and her love of all things cool and bohemian continue to impress and influence me. She is an artist who leads an artistic life, painting on canvas, on baskets, on clothing and designing wallpaper and fabric or whole houses. She is endlessly creative. Her Concept Shop in Westport, Connecticut, is unlike anything I've encountered on our travels around the world. When you walk in you could be in St. Tropez or Venice Beach or Capri. 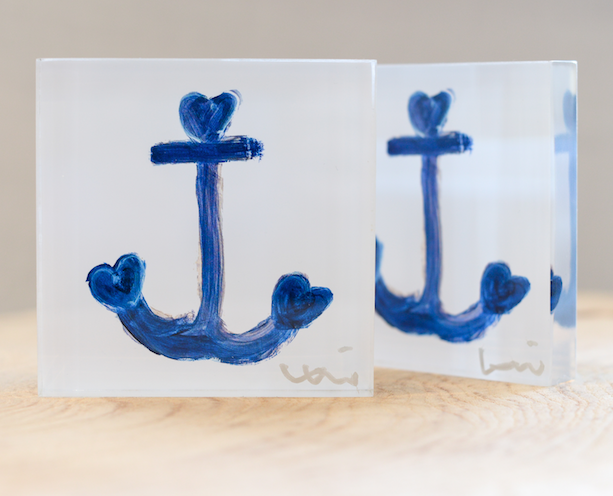 So we present Kerri's Anchor Blocks, 4x4 lucite blocks of her painted anchors. Available only here for a limited time in a limited number. Get yours while they last! Love anchors all. When you're tossed about and lost at sea and feel like there's no hope of getting back to shore, let love be your anchor. This holiday season present this to the people who are the anchors in your life. 4" x 4". $75. Click here to order.